How will IDW Publishing's new ownership role directly impact Top Shelf? IDW's main role will be the support and management of Top Shelf's infrastructure -- production, sales, marketing and promotional initiatives. IDW will also provide additional funding to secure new breakout projects so that Top Shelf can direct their full attention to producing fan-favorite award-winning books. IDW will use its 15 years of publishing experience to further enhance Top Shelf's incredible line-up and ensure that the backlist is always available to an expanded retailer and consumer base. Chris Staros will join the company as Editor-in-Chief of Top Shelf Productions and will expand his role as one of the most innovative editors, marketers and new talent scouts in the industry. Therefore, Top Shelf's fans can expect the same independent editorial approach that has yielded first-rate books and garnered industry-wide awards. While Chris' long-time friend and business partner, Brett Warnock, has decided to retire from the world of comics and explore business opportunities through his newly launched food and nature blog, the rest of the Top Shelf staff will remain in place to continue Top Shelf's indy-focused operations: Leigh Walton as Top Shelf's Publicist & Marketing Director; Chris Ross as Lead Designer & Digital Director; and Zac Boone as Warehouse Manager. How does this acquisition affect Top Shelf's independent creators? Top Shelf publishing agreements will be honored in full, with all creator rights and deal points continuing as they are currently written. 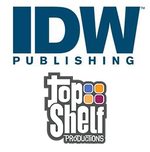 IDW will also be able to ensure that Top Shelf's extensive catalog stays in print, and all creators receive royalties on the solid schedule IDW is known for. IDW has been interested in pursuing an acquisition(s) for some time and earlier in 2014 retained industry veteran Bill Schanes (former VP of purchasing for Diamond) as a consultant to thoroughly investigate acquisition opportunities. Top Shelf, as it turned out, was by far the best of these and Bill facilitated the "matchmaking" early on. Once the companies got to know each other better, the rest was, as they say, history. IDW is an award-winning publisher of comic books, graphic novels and trade paperbacks, based in San Diego, California. Renowned for its diverse catalog of licensed and independent titles, IDW publishes some of the most successful and popular titles in the industry, including: Hasbro's The TRANSFORMERS, G.I. JOE and MY LITTLE PONY; Paramount's Star Trek;Nickelodeon's Teenage Mutant Ninja Turtles; 2000AD's Judge Dredd; The Rocketeer; Toho's Godzilla; V-Wars from New York Times best-selling author Jonathan Maberry; Ragnarök from Eisner Award-winner Walter Simonson; Winterworld, created by Chuck Dixon and Jorge Zaffino; and Little Nemo from the award-winning duo of Eric Shanower and Gabriel Rodriguez. IDW is also home to the Library of American Comics imprint, which publishes classic comic reprints, Yoe! Books, a partnership with Yoe! Studio, and the multiple award-winning Artist's Edition imprint. IDW's critically- and fan-acclaimed series are continually moving into new mediums. Currently, Jerry Bruckheimer Films and Disney are creating a feature film based on World War Robot;Dwayne "The Rock" Johnson and Warner Brothers are producing a film based on Ashley Wood's Lore; Michael Bay's Platinum Dunes and Sony are bringing Zombies vs. Robots to film; and Kurtzman/Orci are producing a movie based on Locke & Key at Universal.